Want to support our students going to camp and have a memorable night of fun at the same time? We’ll be hosting a Trivia Night to help raise funds for those who need assistance to attend Camp Table Rock this Summer. The camp experience is powerful for our students’ spiritual growth, but it’s also somewhat expensive—especially for families with multiple students wanting to attend. Your participation in this event, as well as any additional donations you wish to give for the experience, will all go to help us send students to Camp. Rally your trivia dream team & put together either a 4-person or an 8-person team. 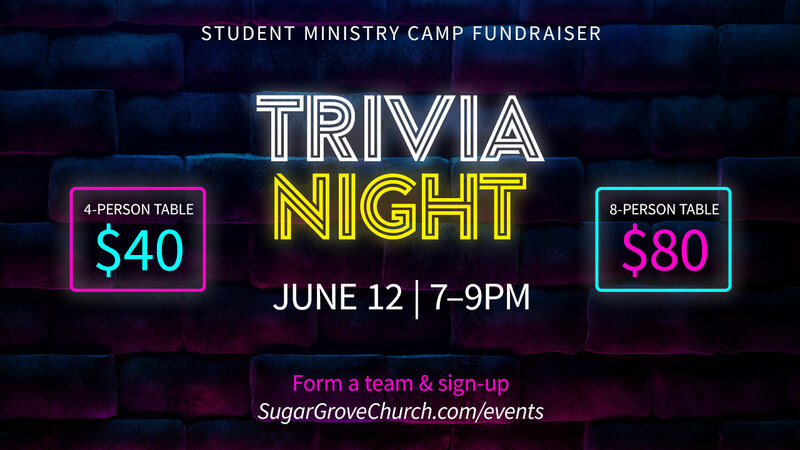 Register your team to take part in the Trivia Night using the form below. If you or your team wishes to donate additional money above the registration fee (or instead of, if you won’t be participating but still want to help), simply add the donation to your submission.